Readers of my notes on our old-vine Zinfandels have probably seen reference to the variety Grand Noir, or more fully, Grand Noir de la Calmette. We often find this variety, an 1855 cross of Petit Bouschet with Aramon noir, interspersed in old-vine vineyards, especially in the Russian River and Sonoma Valleys. As a teinturier (from French, meaning to dye or to tint) grape, it is red-fleshed and red-juiced (red grapes typically have clear juice) but not as deeply colored as Alicante Bouschet, another teinturier variety. 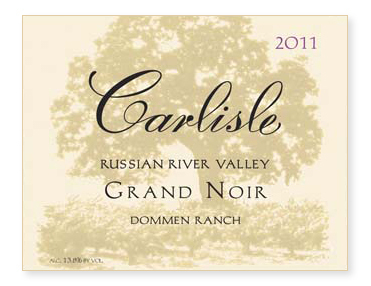 There is seldom enough Grand Noir to pick and ferment separately but at Dommen Ranch, planted circa 1930 in the Russian River Valley, there are two small blocks of the variety. A veritable viticultural rarity! Being the curious type, not to mention a self-admitted grape junkie, I couldn’t resist the chance to try our hand with the fruit. What better way to learn what the variety might add to a blend!